We provide transfers from Milan city to any airport or destination: Malpensa airport, Linate airport, Bergamo Orio al Serio, Bologna, Florence, Genoa, Sestiere, Desenzano, Cernobbio, Menaggio, Bellaggio and many others. If you don’t find your destination in our “Milan Instant Quote”, you can email us and we will immediately send you the quotation for your transfer. Booking your transfer from Milan city centre is very simple, fast and secure thanks to our SSL technology, which protects all the information you entered in the form. Once you have quoted your trip through "Milan Instant Quote" above, click "book now" and enter the information needed for the transfer. At the end of the booking procedure, we will send you a confirmation email with the driver’s phone number and the details about the meeting point. All our Milan transfer prices are fixed, all-inclusive and therefore will not be affected by the traffic and the transfer duration, unless the public taxis. During your stay in Milan, you can book a car with driver; he will be at your disposal for your shopping in the famous streets of Milan fashion, for your dinner in local restaurants, and to accompany you to meetings and conferences. Thanks to our full-optional fleet and options, we can also provide transfers from Milan city center to any ski destination. 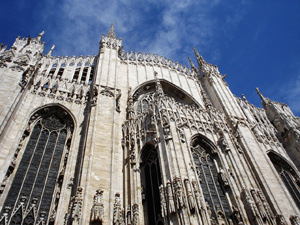 Book your transfer from Milan and save time and money! Let our experienced drivers take you to your destination! If you reach transfers from Naples airport to Sorrento please visit Naples airport taxi to Sorrento.